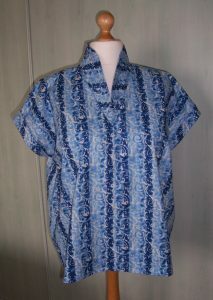 Inspired by garments made by my pen friend in Germany, I decided to try out a tunic top with faced hemline. 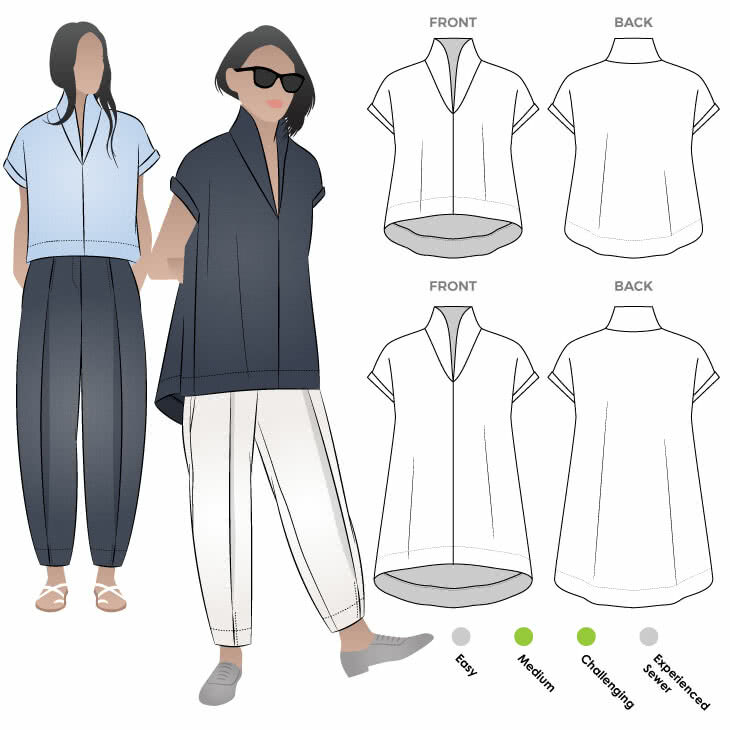 Back in March 2018 I purchased the pdf pattern of TEDDY DESIGNER TOP and tunic by Style Arc. 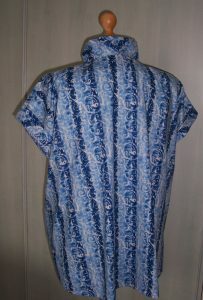 The product description states “This uniquely crafted design comes in two lengths – top or tunic. The gorgeous collar sits high on the neck. The stitched facings and swing back with a high-low hemline give this style a luxe look. 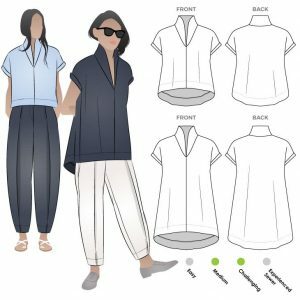 Make the top to give your look an instant update or make the tunic for a more effortless silhouette.” The fabric suggestions are linen, silk, crepe. 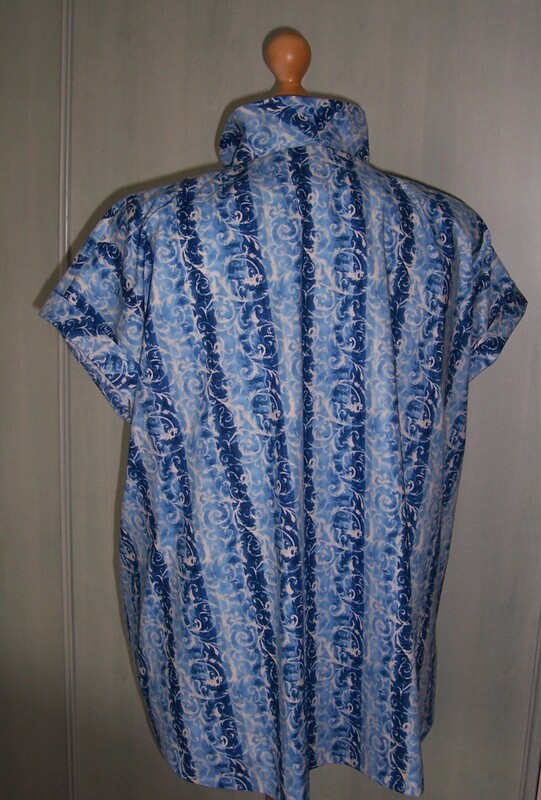 For this wearable muslin from my extensive stash of cotton prints I chose some pre-washed fabric in a Blue stripe print that I thought would be ideal. By comparing the body and ease measurements I decided to use the size 20 and add a little extra at the bust and hips. I then steamed ahead and cut out the pattern. In my haste I forgot to take note of pattern matching and centring of the stripes – I just wanted to get on with construction of this new-to-me styled tunic top. According to the fabric requirements I would need 2.2metres of 148 cm wide fabric. 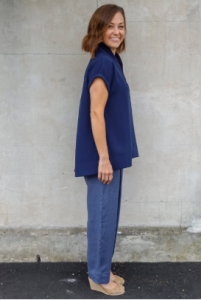 I had just 2 metres of 105 cm wide fabric but by cutting the collar in half and placing the collar on the bias with the collar facing on-grain I succeeded in cutting all the pieces required. To begin with whenever I started sewing, I was interrupted, so the early part of construction was completed in blocks of 20-30 minutes at a time. In fact this worked out well as I was able to prepare the collar, facings, sleeve cuffs and hem facings in advance of the construction of the main body of the tunic. I did find the different seam allowances a little confusing. 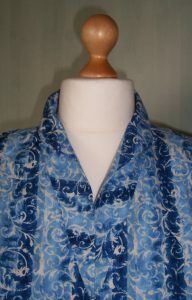 Mostly it was 3/8ths of an inch but on the collar and neckline this was reduced to ¼ inch. 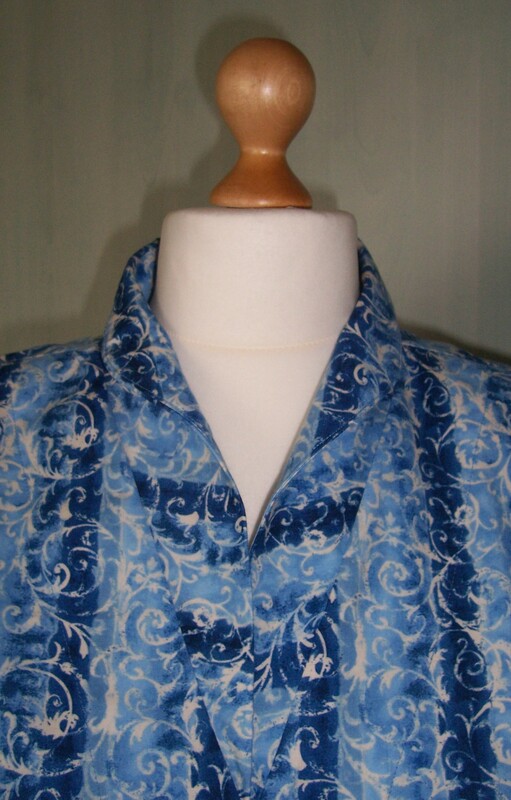 I was pleased that I had read somewhere NOT to sew up the centre front seam of the neckline facing before completing the rest of the collar/neckline facing stitching. Leaving that step until later certainly made life easier. Also I completed the collar and facing construction BEFORE stitching the side seams which meant I could more easily get to this important section for pressing. Slow and steady working my way through the sparse instructions I was then able to whip through to the final construction. 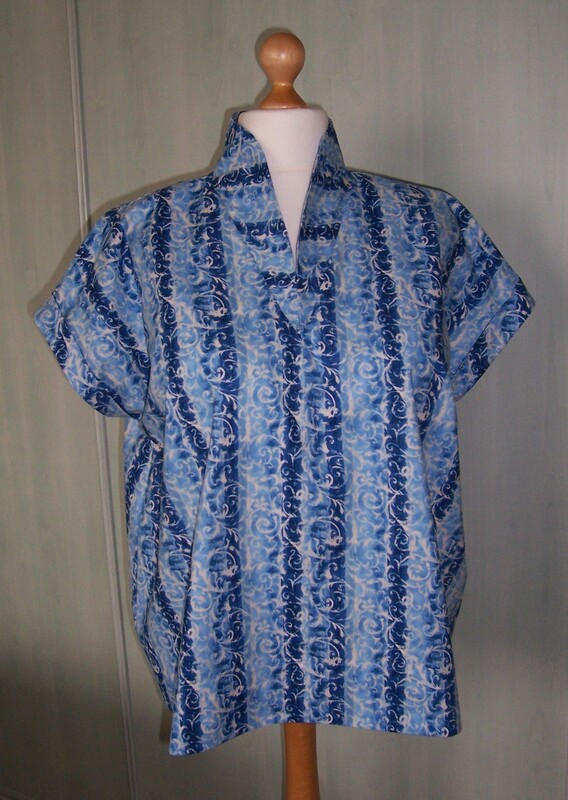 At fitting stage I realised that the additional width was not required and it was removed thus the tunic has been made to a standard size 20. A lapse of attention meant that I stitched the hemline facings upside down so that the shaping at the side seams did not match. I was able to ease the additional fullness in so that was not too much of a disaster. I am pleased with the final result and will definitely be making the tunic again. This style is very comfortable to wear and looks great with leggings or skinny jeans. From the photograph on the website there does not appear to be as much fullness in the back. Next time I will be reducing the fullness by approximately 5-6 inches of excess. I am sure that can be removed without spoiling the design feature of the ‘swing’ back.